Charts show a potential rally for the tech darling ... or a pullback if U.S.-Chinese trade tensions worsen. Is the tech sector all better? Tech led the market higher on Monday, with the Technology Select Sector SPDR ETF (XLK - Get Report) rebounding 3.8%. Software. That's not surprising, as the tech world's big cloud names weren't truly all that subject to Chinese revenue risk in the first place. Red Hat (RHT - Get Report) also reported earnings that were well received. Semiconductors. These stocks reacted very well to news that the U.S. and Chinese governments are trying to hug it out on trade. We should also get more news from the semis on Tuesday, as Action Alerts Plus holding Nvidia (NVDA - Get Report) hosts the 9th annual GPU Technology Conference in San Jose, Calif. As host, Nvidia has the privilege of having its CEO Jensen Huang give the conference's keynote address at noon ET Tuesday. There will be an approximate 20,000 people in attendance, including everyone who's anyone in the fields of autonomous driving, virtual reality, robotics, graphics, gaming and artificial intelligence. Now, it's not often that a chart leaves so little open to interpretation. True, Nvidia's Relative Strength Index (RSI), daily Moving Average Convergence Divergence oscillator (MACD) and Chaikin Money Flow (CMF) leave ample room for improvement in the short-to-medium term. But the stock seems to regularly obey flat-line Fibonacci models and offers almost-strict adherence to the same Andrews' Pitchfork model that we placed on this chart many months back. What we see overall is a name that, like its group, came off of suspected support Monday as if rising from a trampoline. Another positive development is a series of seven consecutive higher lows, coupled with a series of three consecutive higher highs (though just barely so). Keep in mind that NVDA's Chinese exposure represents 18.9% of the company's revenue, so there's real danger there. That said, if President Trump and Chinese President Xi play nice in the sandbox, this stock could from a technical perspective trade above $270 in May vs. its close Monday at $244.48. However, the other side of the coin would be if the Pitchfork model broke. 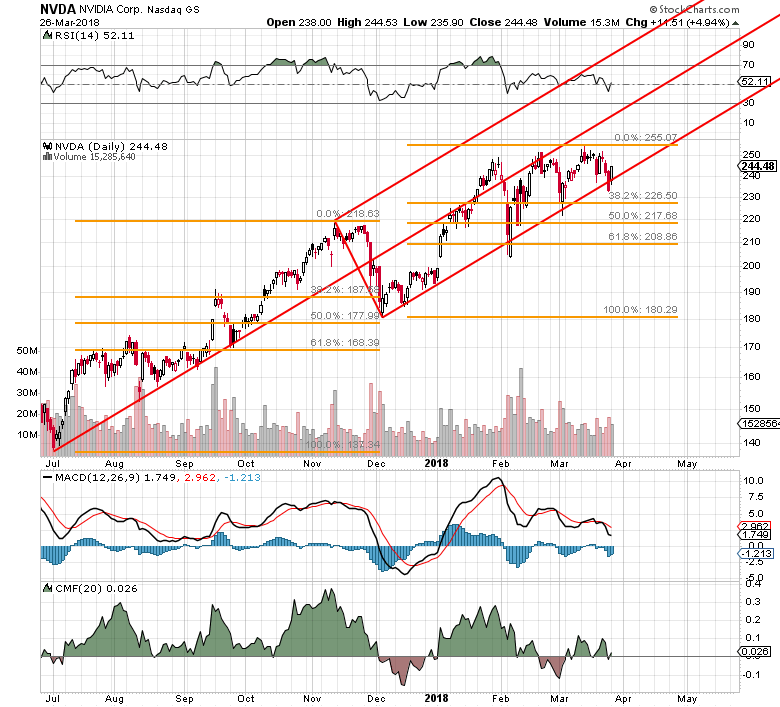 That could allow Nvidia to fall to the Fibonacci line at $226. How might we play this? Well, April 20 Nvidia puts with a $225 strike price closed last night at $3.54 despite a strike that was $19 dollars below where the stock finished the day. So in my opinion, it's safer to buy $265 April 20 calls for $2.79. At the time of publication, Guilfoyle was long NVDA, although positions may change at any time.